Darryl Strawberry is a retired MLB outfielder who played primarily for the New York Mets (1983–1990) and New York Yankees (1995 - 1999). Today he is a very popular speaker who talks about his faith and overcoming addiction. 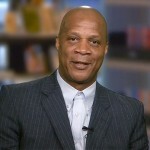 Darryl Strawberry is a retired MLB outfielder who played for the New York Mets from 1983–1990 and ended his career with the New York Yankees. Strawberry was well known for his play on the field and for his controversial behavior off it.Strawberry attended the Mets' 1986 World Champion team reunion on August 19, 2006, where he and the rest of the team received a standing ovation from fans at Shea Stadium in an on-field ceremony. Strawberry worked as an instructor for the New York Mets in 2005 and 2008, and was inducted to the Mets Hall of Fame in 2010. Strawberry has made regular appearances at the New York Yankees' Old Timer's Day, most recently in 2012. He proclaims to be an evangelical born-again Christian and has appeared on The Trinity Broadcasting Network. In 1999, he and Tiny Lister appeared on evangelist Benny Hinn's T.V. program giving their testimonies. Strawberry has also appeared on the 700 Club to talk about his life and his new found faith in Jesus. Strawberry is a popular cancer speaker and Christian speaker. 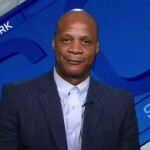 For details on how to book Darryl Strawberry, including information on Darryl Strawberry speaking engagements, Darryl Strawberry speaking fee, Darryl Strawberry appearances, Darryl Strawberry meet and greet, how to contact Darryl Strawberry and Darryl Strawberry agent information, contact a Darryl Strawberry booking agent at Sports Speakers 360 today! DISCLAIMER: Sports Speakers 360 does not claim to represent itself as the exclusive agent for Darryl Strawberry. 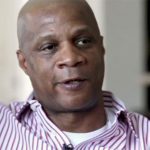 Sports Speakers 360 is a sports talent booking agency that represents organizations seeking to hire athletes such as Darryl Strawberry and other sports celebrities for personal appearances, speaking engagements, celebrity endorsements and spokesperson campaigns. Fees on this website are estimates and are intended only as a guideline. Exact fees are determined by a number of factors, including the location of event, the talent’s schedule, requested duties and supply and demand. Sports Speakers 360 makes no guarantees to the accuracy of information found on this website and does not warrant that any information or representations contained on this website will be accurate or free from errors. We can help your company or organization choose the ideal athlete for your next marketing campaign. If you would like to hire Darryl Strawberry for an appearance, speaking event, product endorsement, charity fundraiser, grand opening, PR campaign, trade show or television or radio commercial, contact the booking agent at Sports Speakers 360 for more information.